Red X in Windows XP Device Manager. 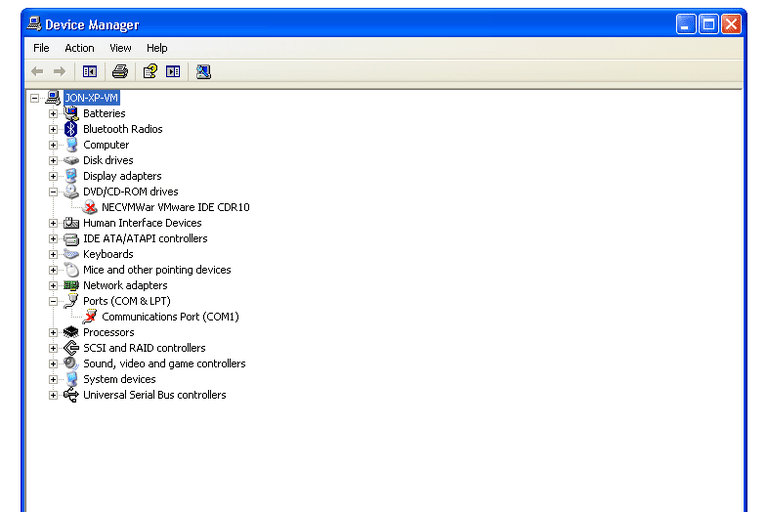 See a small red x next to a hardware device in Device Manager? You may have made a change on purpose that resulted in that red x showing up or there may actually be a problem. However, don't worry about it being difficult to fix - most of the time there's one really easy solution to a red x in Device Manager. What Does the Red X in Device Manager Mean? A red x next to a device in Device Manager in Windows XP (and back through Windows 95) means that the device is disabled. The red x doesn't necessarily mean there's a problem with the hardware device. The red x simply means that Windows is not allowing the hardware to be used and that it has not assigned any system resources to be used by the hardware. If you've disabled the hardware manually, this is why the red x is showing up for you. To remove the red x from a particular piece of hardware, you'll need to enable the device, which is done right there in Device Manager. It's usually that simple. Enabling a device in Device Manager just involves selecting the device and changing its properties so Windows will start using it again. Read our How to Enable a Device in Device Manager tutorial if you need help doing this. Versions of Windows newer than XP don't use the red x to signify a disabled device. Instead, you'll see a black down arrow. You can enable devices in those versions of Windows, too, also using Device Manager. The tutorial linked above explains how to enable devices in those versions of Windows, too. Disabled devices generate Device Manager error codes. The specific error, in this case, is a Code 22: "This device is disabled." If there are further issues with the hardware, the red x will probably be replaced with a yellow exclamation point, which you can troubleshoot separately. If you've enabled the device in Device Manager but the hardware still isn't communicating with the computer like you know it should, it's possible that the driver is outdated or even missing entirely. See our guide on How to Update Drivers in Windows if you need help fixing that type of problem. Although a missing or outdated driver may be the cause of a piece of hardware not working with Windows as it should, the red x seen in Device Manager has nothing to do with whether or not the driver is installed. It just means that the device has been disabled for whatever reason. Most devices that aren't working at all even after enabling them in Device Manager, can be deleted from the list in Device Manager. Reboot the computer after deleting the device to force Windows to recognize it once again. Then, if the device still isn't working, try updating the drivers. You can open Device Manager the normal way through Control Panel but there's also a command-line command you can use, which is described here.